Happy Sunday, Friends! I hope this weekend has been full of joy and love and rest for you. We did a lot of the opposite this weekend, as we partook in the madness that is March college basketball. My husband (an Auburn fan) and myself (a UK fan) will have to duke it out later this afternoon as our teams play each other in the Elite Eight match, so pray for us. For your lazy-day entertainment, I’ve rounded up a list of things I’ve been reading, eating, and shopping for, plus I’m sharing the how-to on this seriously adorable lemon lavender icebox cake. Grab a fork and let’s dive in! I relate to this article on “crispy-gone-soggy” foods (think soggy nachos, leftover General Tso’s carryout, etc) on so many levels. It’s an opinion piece from Bon Appetit that is entirely funny and delicious on so many levels. Check it out for a casual laugh and stomach rumble. Food52’s annual cookbook tournament has just wound down, and I am so thrilled to pick up copies of the winning books. Basically they’ve picked some of the most eye-catching cookbooks from the year go head-to-head in a bracket-style throw down. The judges are mostly renowned chefs who whittle the list of best cookbooks down from 16 to 1. 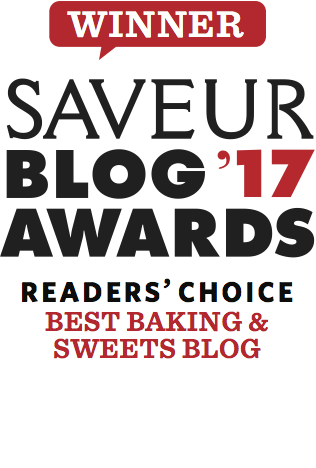 Read about the finalists (and the winner!) here. 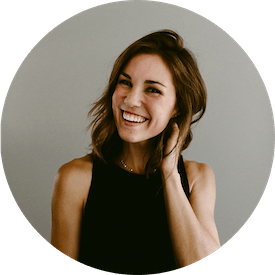 I’m just wrapping up “Everybody, Always” by Bob Goff. It’s a heartwarming, inspiring, and, at times, difficult read, but there’s so much truth in it that I love it. Loving people can be really hard, but Bob breaks this lifelong pursuit down to just loving the person in front of you, one day at a time. Such a good read. With warmer weather and bathing suit season on the horizon, we’ve been trying to include lots of salads and veggies in the dinnertime lineup. This bulgur salad with cucumbers, dill, chickpeas, and peppers is anything but basic, and it’s probably my favorite dish I’ve prepared in months. Serve with grilled chicken or fish if you’re cooking for a meatatarian, otherwise, this salad needs no other sidekick. Ok, so I must not be really concerned about that summer body, because we’re still totally making burgers. These ones are smashed thin like the ones you might get at a greasy diner, and they are outrageous delicious. We top ours with grilled red onion and serve with skillet hash browns. My mouth is actually watering. I love how easily a pork tenderloin will serve my family of four, but I’m always getting stuck in the savory herb-crusted rut. This recipe from Tyler Florence boasts a chimichurri sauce that is to die for and makes the whole dish feel fresh and exciting. Serve with rice, beans, and grilled veggies. The Madewell spring collection has me longing for non-maternity wear. The bright colors, flowy materials, and simple retro patterns are 100% my ballgame. I just ordered this bathing suit coverup both for now and post-baby. When I’m chasing after two kiddos at the pool, I don’t want to worry what is falling out of the backside of my suit, and this coverup is the light and airy ticket I’ve been looking for. Plus, the side tie means that I can wear it as my body transitions in the coming months! The springy dishes and serveware at Sur La Table have me itching to throw a garden party. I’m dying over the new cast iron colors and floral china. Check it out here. Lemon lavender icebox cake. Isn’t she a beaut? I love how dainty and fancy this sweet make-ahead dessert feels, and I love the ease with which I’m able to prepare it. 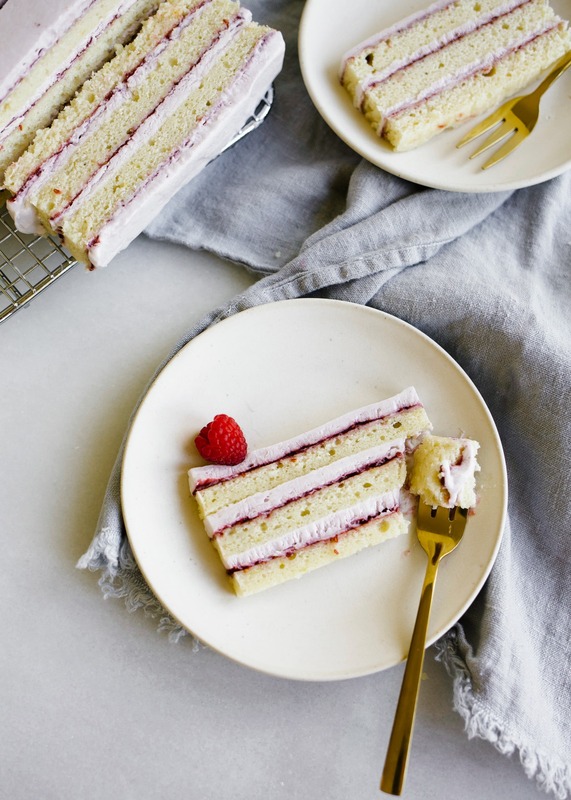 Made with a fluffy and citrusy lemon cake, a lavender-infused whipped filling, and sweet raspberry preserves, this cake is the springy layered treat your tables have been begging for. 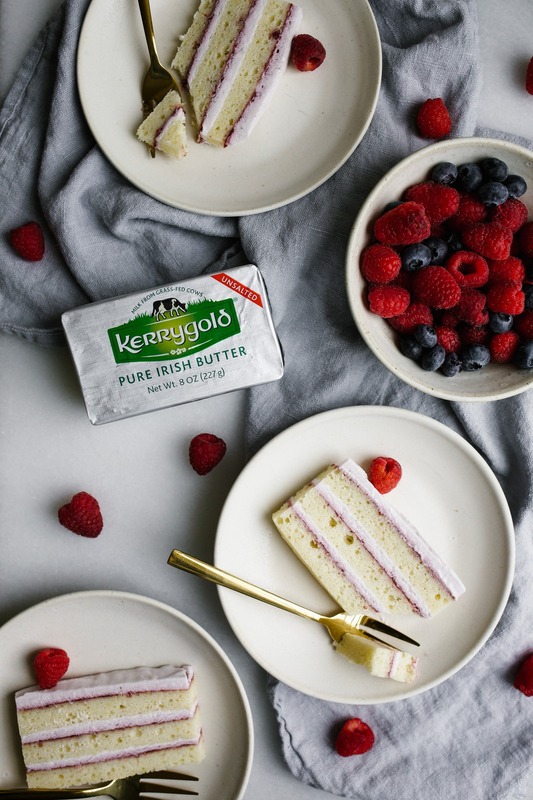 I made this lemon lavender icebox cake in partnership with my friends at Kerrygold. Their unsalted butter keeps the lemon cake moist in spite of the cake’s time spent in the icebox, and it adds a subtle richness to every bite. I love having a go-to butter brand to suit my favorite decadent desserts, and this little freezer-friendly cake is no exception. To make this lemon lavender icebox cake, we start by baking the cake. This cake whips up easily with butter, sugar, eggs, and the usual suspect dry ingredients. The juice of the lemons adds tang and acidity to this cake while the zest adds a fragrant, lemony taste to every bite. We bake the batter in a half sheet pan and allow it to cool completely before we throw it all together. The filling for this lemon lavender cake is basically a bulked-up whipped cream. We add in a little cream cheese to the mixture to stabilize the airy whipped cream which gets its flavor from an infusion of dried lavender. I purchased a small bag of dried culinary lavender on Amazon, but some of you big city folks may be able to find it in your grocery stores. To assemble this lemon lavender cake, we invert the cooled cake out of the pan and cut it into three equal-sized rectangles. I use a big ruler for precision, but you can wing it if that’s more your speed. Spread a thin layer of prepared raspberry preserves all over each piece of cake and then begin stacking! 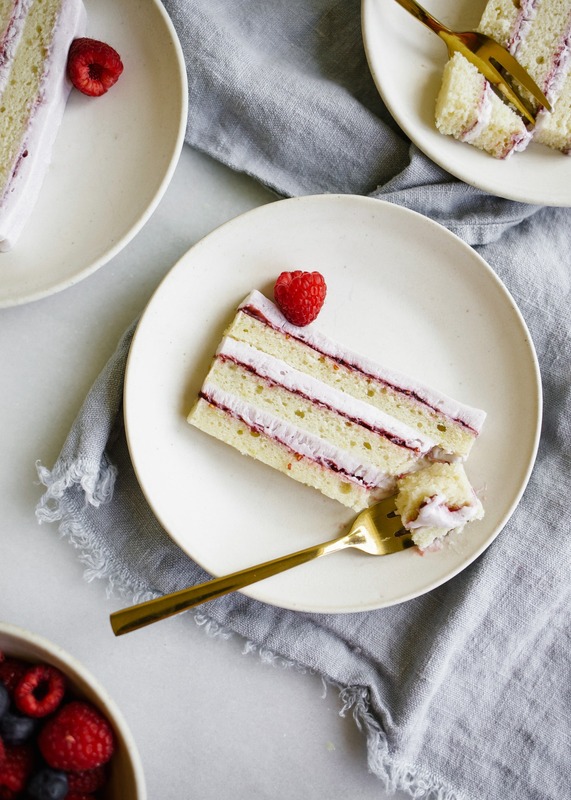 Place your first piece of raspberry-coated cake on a small, freezer friendly platter. Dollop 1/3 of the infused whipped cream on top and gently spread to a flat layer. Stack a second piece of cake and repeat this process again. Take care to spread the whipped cream as flat and evenly as possible to maintain a more stable cake. Some of the whipped cream may barely squish out the sides of the cake as you stack it, but don’t worry. Just be careful to not press down hard on the cake and remember it will all firm up in the freezer. Leave the lemon lavender icebox cake in the freezer overnight, and, once frozen, feel free to trim up the edges to form neat rectangle slices. I cut 1/2″ pieces for serving, but you could also cut squares or wedges if you please! Just be sure to show off all those fancy layers, because, DANG, they are beautiful. 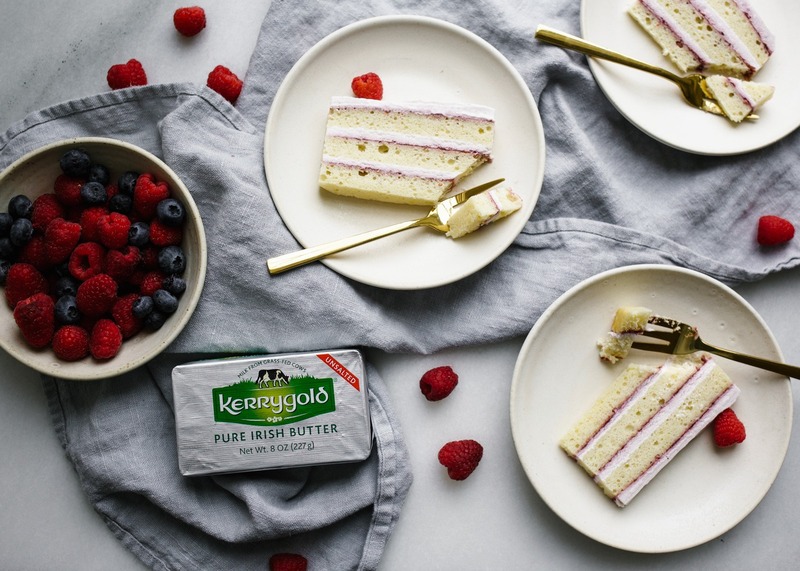 Many thanks to Kerrygold for sponsoring this delightful spring treat. It’s an honor to partner with a brand that I trust and adore so much, and I hope you all will welcome them to your kitchens as well. Enjoy this Sunday, enjoy some time spent baking, and GO CATS. 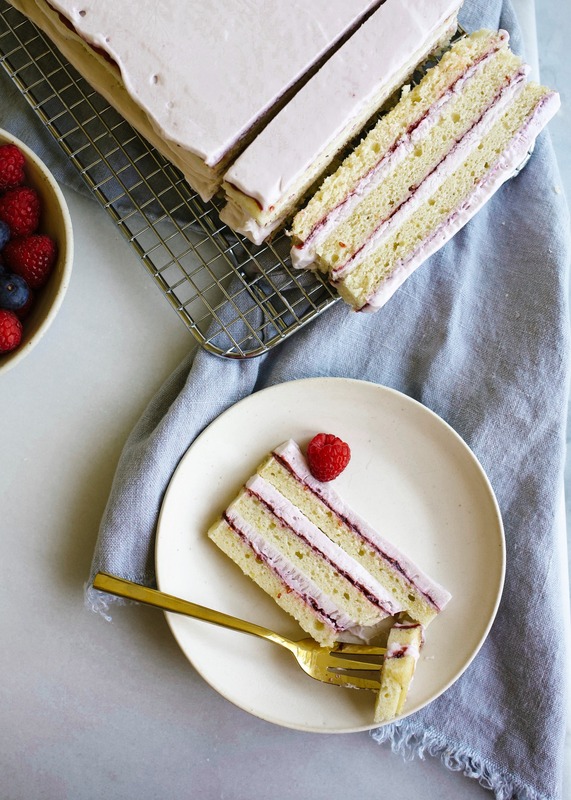 This lemon lavender icebox cake is a chilled springtime treat with lemon cake layers, lavender whipped cream, and sweet raspberry preserves. Lavender food coloring, if desired. Preheat the oven to 350 degrees and spray a half sheet pan (18″ x 13″ x 1″) with baking spray. Line the bottom with a rectangle of parchment paper and set aside. In a large bowl or the bowl of a stand mixer, cream together the butter and sugar on medium speed until fluffy, about 2 minutes. Scrape the sides of the bowl and add the egg whites and vanilla and mix to combine. Scrape the sides of the bowl and add half of the milk plus the lemon juice and zest. Mix until combined and then add about half of the flour as well as the baking soda, baking powder, and salt. Scrape the sides of the bowl and add the remaining milk followed by the remaining flour. Mix on low only until combined and scrape the sides of the bowl. Fold in any unincorporated bits and spread the batter into the prepared pan. Bake in the oven for about 13 minutes or until a toothpick inserted comes out clean. Set aside to cool completely. Combine the whipping cream and lavender in a bowl and cover with plastic wrap. Allow to rest in the fridge overnight or at least 6 hours. When ready to prepare the cream, cream the cream cheese and sugar on medium speed in a large bowl until combined, about 30 seconds. Slowly drizzle in the cream while the mixer is on low to incorporate. Add the vanilla extract and continue beating on medium speed until the mixture has thickened and stiff peaks form. Add a smidge of light purple or lavender food coloring if desired. Set in the fridge until ready to use. Invert the cake out of the pan and cut along the long edge into three equal pieces. You’ll wind up with 3 rectangles of cake about 5-1/2” x 12-1//2” in size. Spread 1/3 of the preserves on each piece of cake in a thin even layer. Place on piece of the jammy cake on a serving dish and spread 1/3 of the lavender whipped cream on top. Smooth to flatten the whipped cream without overworking the cream and then top with another jammy piece of cake. Repeat this process once more finishing with the remaining layer of cake and lavender whipped cream on top. Place in the freezer to firm up the top quickly, about an hour, and then cover gently with plastic wrap and continue freezing for another 6 hours. You can clean up the edges of the cake by cutting through the frozen layers to even them up, if desired. Otherwise, slice ½” wedges for serving and top with fresh raspberries, if desired. I prefer to slice while frozen and then let the slices warm up slightly at room temp for about 10-15 minutes prior to serving. Otherwise, let the cake barely thaw at room temp for about 20-30 minutes prior to slicing and serving. The culinary lavender I have is not ground up and fine. Should I strain the lavender/cream mixture before whipping or will it smooth out during the whipping? This cake sounds delicious!! Lovely Ideas ! Thanks for sharing such a great knowledge with us. I made this for company last weekend. It was so delicious, and very well received. Just the right touch of lavender, without veering into perfume territory. Thank you—I’ll definitely make it again. Is this supposed to be a served frozen? Or is it frozen to just to make perfect slices? Hi! How long can you freeze this cake? I’m wondering if it can be made ahead of time. It’s absolutely lovely. Thanks!